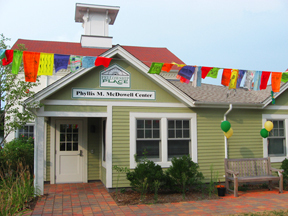 To meet the needs of a growing number of young adults coming through our doors, in March 2010 Fellowship Place utilized private funding support to develop specialized services for adults, ages 18-25 who suffer from mental illness. This program helps young people connect with their peers and engage in positive activities. They are encouraged to assess their interests and plan for their futures, through building healthy relationships, developing life skills, & exploring the community. The group meets 4 days a week. Weekly programs vary and are planned by the young adults and a Staff Facilitator. The Calendar includes dinner, pool, ping-pong, trips to the mall, museum, library and zoo, grocery shopping and healthy cooking lessons, pizza in the park, an HIV educational presentation, peer group discussions, and holiday themed events. The successful implementation and popularity of the program has sparked further interest from the community, resulting in a collaboration with Community Services Network in New Haven to establish a Young Adult Services work group, co-chaired by Fellowship Place’s Executive Director and Carolyn O’Keefe, from the Connecticut Mental Health Center. This group is working on the development of training for professionals working with young adults and identifying the most effective ways of engaging the population.